I am blessed with the best of friends. During childhood, college and adulthood, the trend continues.Yesterday my friend and I went out to lunch at another friend's place and had a very delicious home-cooked meal and a fabulous time. I decided to surprise my friend with these toasts that are packed with nutrients and has a peppery kick to it. I have used walnuts, cashewnuts, pistachio and loads of pepper. Have these with tea in place of a fat loaded cookie. Walnuts, pistachios and cashewnuts are packed with nutrients we need to combat cancers, heart diseases, help in metabolism, prevent ageing, most importantly help to lower LDL cholesterol and increase HDL cholesterol. .Preheat oven to 180 degree C/350 degree F/Gas mark 4). .Grease a 4x10 inch bar tin. .Lightly crush the peppercorns and set aside. .Sift together flour, ginger powder, cinnamon powder, and nutmeg powder. .Mix together the flour, nuts and the pepper lighlty. .Beat the egg whites and brown sugar till the mixture turns white and thickens. .Gently fold the flour and nut mixture into the egg mixture. .Spread the mixture into the prepared tin and bake for 35 to 40 mins. .Cool in the tin for a minimum of 2 hours. .Turn onto a cutting board and cut 2mm thick slices using a bread knife. .Turn the sides and bake for another 10 minutes or until the slices are crisp and dry. .Cool completely and store in an air tight jar. .Enjoy with a hot cup of my favourite African Ruby tea or any of your favourite teas. *note:You can use a parchment paper before spreading the mixture in the bar tin. Just grease the tin and layer the bottom and sides with the parchment paper to enable ease of releasing the cooked bread from the tin. outstanding with a cappucino!! !....and a super tasty munchie!!! 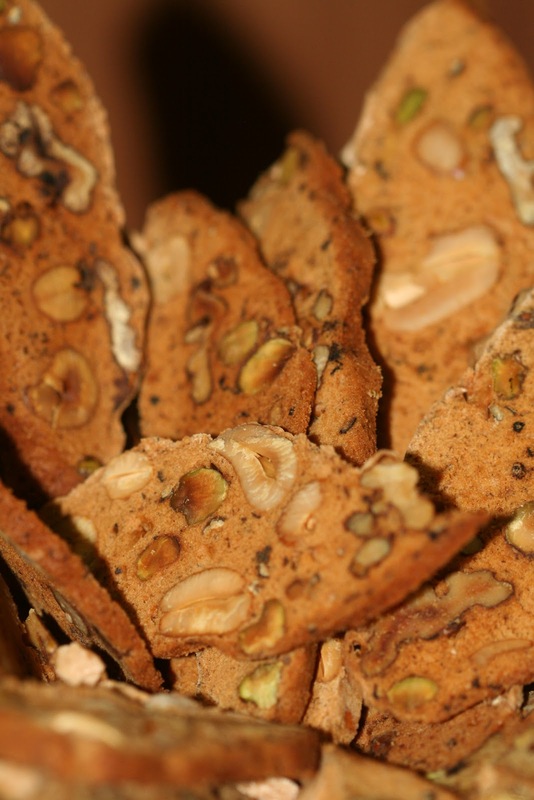 I've trie tried this and it's a biscotti with a kick, the pepper just hits your taste buds at the very end - simply delicious ! thank you Jaya. I am happy you enjoyed it. This is something that is best consumed when its baked by the Prima Dona herself :-)! If I am in that part of the world and you have nothing better to do, will surely love to have some. Seems awesome! Sure, you are welcome. I would love to meet a confirmed foodie.